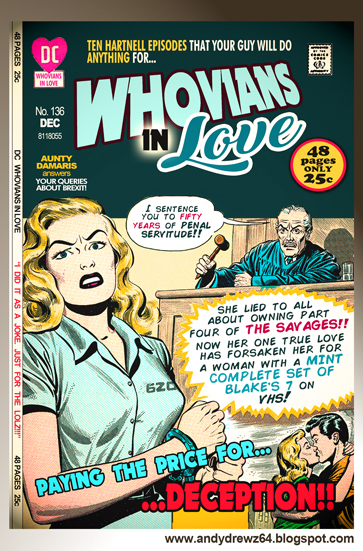 Andydrewz's Pages: Whovians in Love special emergency topical edition! Whovians in Love special emergency topical edition! Someone put a fake eBay listing up for episode one of the missing Doctor Who adventure 'The Savages' last week. At the risk of sounding arrogant, it didn't fool me and just looked a bit like a desperate cry for help and attention. 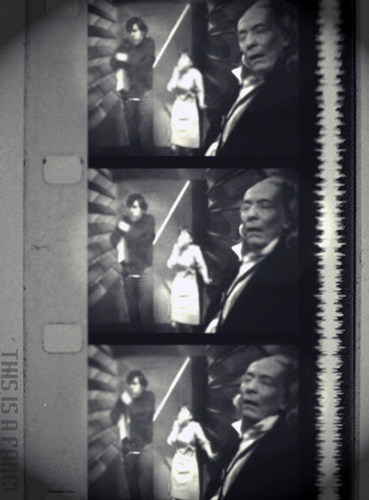 Some dreadful photoshopping - worthy of my early efforts on this blog - coupled with the usual vague details of provenance one associates with this sort of 'wheeze'. Sadly, a small number of fans were taken in by the scam. Even more sadly, a large number were also 'up-in-arms' about it despite seeing through the attempted deception meaning the perpetrator gained even more publicity oxygen. My attempt to create a missing episode fragment is to the right... IT IS A FAKE! Anyhow, my usual absurd view of the world was applied to the sorry situation and, at the risk of giving him more net-time, I came up with this rather angry issue of Whovians in Love. Doctor Who VHSs are back! Live the dream..!! !